On a recent visit to France, Sheila and I visited the ancient Abbey of Landévennec, south-east of Brest. The abbey was founded late in the 5th century by Saint Guénolé who, like us, also came from Britain. He was initiated into monastic life by Saint Budoc on the island of Lavret in northern Brittany. Budoc apparently came to Brittany from Ireland (probably via Cornwall). When the time came for Guénolé to establish his own monastery, he chose the beautiful site of Landévennec nestling on the banks of a meander in the wide estuary of the L’Aulne river. At about the same time, to the south in Italy, the Italian monk, Benedict, had written his Rule of Monks and some years after Guénolé’s death, the monks at Landévennec decided to adopt the Rule of Saint Benedict. Over the centuries the abbey endured some turbulent times – the monks had to go into exile in the 10th century when their monastery was attacked by the Vikings and at the French Revolution the abbey was sold and a good deal of the stone quarried. However in 1875, the Count of Chalus bought the abbey and set about the task of saving the ruins. 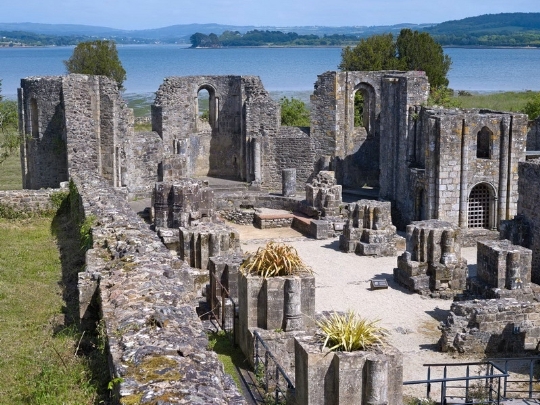 In 1950, the Benedictine Community bought back the land and began to rebuild the abbey, resuming monastic life achieving once again a balance between solitude, communal living, prayer and work. Happily Sheila and I were able to join a well-attended congregation from the local area, including young families and teenagers, for mass in the abbey church. With our rudimentary knowledge of French we were able to follow the familiar words of the liturgy and understand parts of the sermon. As we sat there a thought that often excites me came freshly into to my mind. No-one who celebrates Holy Communion – whether in an abbey church, grand cathedral or sitting around a table covered with a white cloth in a simple chapel does so because they have suddenly read the accounts in the Gospels of the institution of the Lord’s Supper. They don’t do it because they feel compelled, on impulse, to follow the command of Jesus ‘This do in remembrance of me’ (although that would be a fine motive). They do it because this has been the practice week by week in their local Christian community: ‘we do it this week just as we did it last week’. And so celebration of Holy Communion stretches back (in the words of J.B. Phillips) like an ‘unbroken thread’ over the centuries right back to that day in the upper room in Jerusalem when Jesus ‘took bread, and after blessing it broke it and gave it to them … and took a cup, and when he had given thanks he gave it to them, and they all drank of it … and when they had sung a hymn they went out to the Mount of Olives’ (Mark 14:22-26). Somewhere, week by week for two thousand years, whether in a room in Jerusalem, an abbey church, cathedral, parish church, or tiny chapel Christians have been sharing in the body and blood of Christ. And wherever we go, as brothers and sisters in Christ, we know that we are members of the same international family which stretches back to Saint Guénolé and the master he followed.